Susan was kind enough to impart the recipe to me, so here it is. It's so easy to make - less than 15 minutes of prep and cooking (outside the oven), and ~2.5-3 hours of cooking in the oven. Brush lamb shanks with oil. Preheat a pan until moderately hot and brown lamb well. Transfer to a large casserole dish. Add oil to pan with onion and cumin. Cook for 1 minute. Add tomatoes, stock, honey and juice. Bring to boil then spoon mixture over lamb. Cover the the casserole dish tightly and cook for around 2.5 to 3 hours, until lamb is falling off the bone. 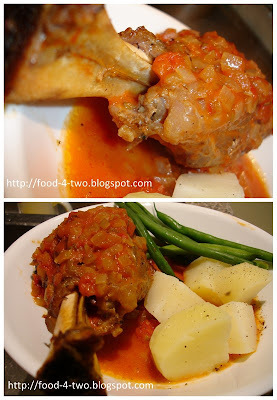 Thanks for your feedback - let me know how the lamb shanks turn out.